Finally - a real table saw! I didn’t do any actual woodworking today, but I did do the next best thing – I got a new (to me) tool and worked on it! 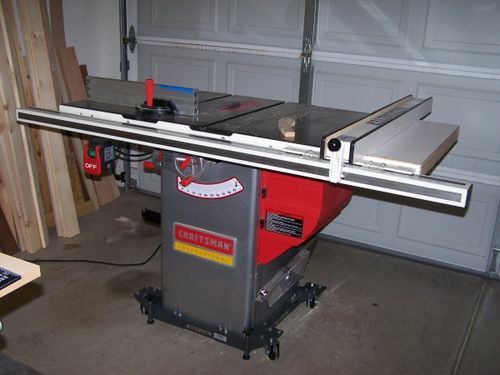 I bought a used Craftsman 221240 for $200 last week and it was delivered today, 3/19/2010. I paid to have it moved since it weighs about 400 pounds and I didn’t have an easy way to move it myself. Otherwise, my plan was to take it apart and move it that way. Now I almost wish I’d done that since I just about took it all apart anyway after it was delivered. I’m not going to discuss the merits of the operation (yet) since I haven’t used it to cut anything yet. The two cast iron extension wings are only attached with 4 bolts each. The Beisemeyer fence and extension table have a few more bolts / screws but it wasn’t hard to remove it either. If I’d taken those off at the sellers home I could have moved the saw in my pickup. I just didn’t know how easy it would be before paying to have it moved. Oh well, it’s done now and I’m happy I’ve got it! The seller has had the table about 4 years. She was getting rid of it in large part due to a divorce. The extensions all had some adjusting to do so I ended up removing some of the fence and adjusting the extensions. The cast iron extensions both have a dip in the middle, between the front and back of the table, maybe 1/32 or less (I didn’t measure it). I got the front and back of the extensions aligned with the main table but there’s a bit of a drop between the main table and the extensions in the middle. Since I don’t cut much big wood I hope it doesn’t affect me, and I’m glad it’s a dip instead of being proud of the table. Also, the two cast iron extensions droop slightly away from the main table. The Beisemeyer extension has a problem too. It seems flat but it won’t sit perfectly flat in the rails because the top extends past the frame on the back side, farthest from the blade. When I get the extension aligned with the steel extension, then tighten the outermost bolt, it ends up forcing the table top higher as it squeezes in on the frame. The joint between the frame and top hits right near the top of the rail, which is rounded, and the table ends up riding up when the rail bolt is tightened. I think this can be corrected by using a flush mount router bit with the frame as the guide and shaving the extension top to be the same dimension as the frame. Once I got the tables/extensions aligned the best I could, I cleaned out the zero clearance plate adjustment screws and 0 and 45 degree stop screws. I oiled all the screws and aligned the stops. The zero clearance plate will probably have to be replaced, and I plan to try to make one. This one has a good dip in the middle, from front to back (is that normal?). I had to settle on adjusting it – I think all four corners are at slightly different heights in order to prevent rocking and to get it as level over all as I could. I brushed off the dust from inside, lubed the gears, lubed the cranks from outside. After that I cleaned all the working surfaces 3 times with mineral spirits. I had to use a bit of green weenies on the top to remove some rust. I didn’t get it all but it’s good enough. Then I waxed the same surfaces 3 times with Johnson’s paste wax. It’s nice and slick! I also cleaned & waxed the miter and grooves and moving fence parts. I got the fence back together and installed. It wouldn’t lock (the seller told me about this and she never liked the Beisemeyer because of it!). After reading about it online, there’s a pad that goes on the locking lever that the cam presses against. It is missing. I temporarily hot glued a piece of soft plastic and it clamps fine – I’ll get the pad ordered soon (but first I’m going to talk the Beisemeyer folks – they’ve got an office here in the Phoenix area and I’m hoping I can get the pad directly from there!). I cleaned up the rest of the miter – quite a contraption! It’s got a clamp and a stop. The miter has adjustable stops on it too but I haven’t adjusted them yet. Except for the table not being perfectly flat, this thing seems built really well and has held up well. The seller used it some but not heavily and it looks good. There are a few things that bug me but they’re not because it’s used, but because of the manufacturing (I can’t adjust the blade angle guage enough to get the needle on zero and other little nit picky things). I think the fence will be wonderful (even with my temporary fix the far end can’t be budged and it locks exactly parallel to the miter slot after slight adjusting). I can’t wait to start using it! First, I made a few cuts with the saw over the weekend and I really like how solid it feels. I had the splitter mounted, and the rear support is bent. It works okay as a splitter and is aligned okay but it causes a slight binding of the work piece to the fence. I need to figure out how to straighten it out, or replace it, or just don’t use it. I got a bit of a rough cut which I’m wondering if it’s attributable to arbor run out that I’ve received some comments about. Or, if it could be due to the slight binding due to the splitter. I’ll look into it some more and appreciate the emails I’ve been sent about how to set up the saw. Second, I contacted Biesemeyer about the issue regarding the fence not locking down. I spoke to Jeff and he is sending me a pad for the cam foot assembly – free, no shipping, nothing! That is service! I didn’t even buy the fence new and they’re still taking care of their end users! If I ever replace this saw I think I’ll always use a Biesemeyer fence! I finally got my Shop Fox mini Mobile Base and got the saw on it. I like it! Now I can move the saw around as needed. I’ve also added a 4” to 2-2/1” converter for the dust collection which will be nice. I’ve also been using the saw more, and every time I do I really enjoy it. I’ve started getting it really nice and square and it’s such a pleasure to have a tool that does what you want. Following some advice I’d received regarding this saw, I purchased a Grizzly G9849 Magnetic Base/Dial Indicator Combo to test the blade, arbor, and flange run out. After struggling to figure out how to mount the dial indicator in order to measure the arbor and flange, I was able to test things. This dial indicator unit is the first one I’ve owned and the only one I’ve used for this purpose. Watching a few youtube videos showed me that just about everyone else does the same thing with this sort of dial – you have to come in to the arbor or flange at a bit of an angle. I’m no genius but I know that due to the angle the actual reading won’t be accurate. That said, both my arbor and flange run out registered about .0005 deflection max (half a thousandth). I don’t know the exact angle the indicator was at, but the actual horizontal deflection would be less than the deflection measured at an angle, so I’m pretty happy with the measurements! I have the Steel City version of this saw. If my experience is any indication, you will enjoy it. And you got it at a heck of a price. My advice is to buy a thin kerf Forrest WW2 for it to maximize the capability of the 1.75 hp motor. I have the same saw and love it. You did get an excellent deal from the looks of it. IMHO I’ve used Freud standard 1/8” width saw blades with no problem at all – just keep them sharp. As for the dip … I don’t have any type of dip in mine – the whole table top is dead flat. However, I did have to shim one side with 1 piece of construction paper to get all side flat. I’ve always wanted to replace the right side masonite table with a router table … just haven’t gotten a round tuit yet. I’ve cut a lot of 4/4, 6/4, & 8/4 wood with the 1.75 hp moter with no problem. Just use good saw blades and keep them sharp. I also have an 8” dado saw – I kinda wish I would have gotten the 6”. No special reason … it cuts just fine, just haven never used all that is available on the 8” – I could have saved a few bucks. Once you do the whole table saw tune up you’ll have peace of mind that you have an excellent table saw. It should serve you well. That was a good deal for 200, especially with the Beisemeyer. It looks in very good shape too. My brother has this saw and likes it. New this goes for 1099. I agree that you got a great deal on the saw. I have had one for about four years and it has been solid – the fence is excellent. I have a thin-kerf ripping ripping blade, but for the most part I use my standard-kerf Forrest WWII 40-tooth blade. I would not worry about the blade angle indicator on the front of the saw. Mine does not go to zero either, but I am sure that I would never use it anyway because there is no way that it could be accurate enough. Congratulations and enjoy your saw. WOW what a deal. you do need to check the Arbor Flange Runout . I have the same saw and it serves me well. But, I paid a heck of a lot more then you did. I have the same and paid a LOT more then you. Dont worry about the needles pointing to zero (If it bothers you, just bend it in place) I always re-true it if I’m doing really precise work. My table is dead-on flat. based on all the positive comments, it is nice to see Craftsman getting serious about quality tools again. I don’t understand why this tool has 5 stars. You haven’t used it yet (so its not the performance). The side tables are not flat, they dip in the middle (1/32” is a lot of deflection) and they droop on the sides. The Beisemeyer extension has a serious problem. The blade angle indicator does not go to zero (and is therefore not accurate). There are a few things that bug me… because of the manufacturing (I can’t adjust the blade angle guage enough to get the needle on zero and other little nit picky things). Separately, I think you got a great buy on this saw. I have seen several good reviews from people who have used it. I think you should have made this a tool gloat and not posted it as a tool review in the review section. I would be interested in reading your review of the saw after you have actually used it. Finally, remember, the fence does not need to align parallel to the miter slot. It needs to align parallel to the blade. Thanks for all the comments and suggestions! Tim & Southpaw – I’m sure I’ll get one or the other of those blades. I keep hearing pros and cons about both. Why didn’t you stick with the Lietz (I’d never heard of those until this saw)? Is it worth sharpening? Deke – my thoughts exactly! ChuckV, CampD – I’m not really worried about, nor plan to use (at least, not rely on it) the angle gauge. I just wish it was more adjustable if they’re going to make it adjustable. I see you can adjust the pointer as well but the screw head is damaged. eddy – thanks, that’s great news! I’ll check that out. It wasn’t mentioned in the manual. Jack T – I didn’t change the rating at all but will after I use it (I have gone back in and done that on other posts, and that’s why I put the disclaimer at the top). The blade that came with the saw – it might have been a Lietz – was WAYYYYYY to loud. I did have a very slight arbor flange runout on mine that I forgot about. It is easily fixed but it takes time – you definitely do NOT want to over work the fix. I’ll see if I can find the link on how to do it. They had that on clearance at my local Sears for $350 last year and it replaced my then current saw which was a craftsman 22114. I think you’ll like it. Even though my saw was new the throat plate also had a bow but was not a big problem for me since I always replace mine with an mdf zctp. I end up making a dozen and use them for tk and fk blades and different size dados. Maybe I missed it but did you check if it was flat from left to right? I had to shim my extension wings to get them dead flat. Only other suggestion is making an outfeed table.